The Holocaust. The hate, the horror, the throbbing hurt of a nation in ruin. Rivers of ink, museums of memorabilia, and so many words still falling woefully short in depicting its ravage. A new generation, gratefully sheltered from its ever more distant past, yet bearing the same burden of remembrance. Some events are too cataclysmic to be relegated to the annals of history and the archives of yellowing libraries. As living survivors become a precious rarity, their priceless accounts are our inheritance to cherish. While the secular world’s call of “Never again!” bespeaks a haughty condescension toward the Kedoshim of our nation, we raise our youth with the dictum of “Never forget,” spurring them to recall our past and live their present and future on the underpinning of that cognizance. Join us in speaking to one special survivor who has recently written a memoir of the Holocaust on his experience and the uniqueness of his story. “Witness: A Story of Survival and Triumph,” the memoir of Reb Mendel Tessler of Brooklyn, is more than just a book. It is the story of our nation’s eternal survival and the never-ending chain of Jewish generations. He vividly describes the ways and wisdom of his grandparents and parents, while living his own life emulating those ways and modeling them for his children, grandchildren, and great-grandchildren. Through searing pain and ultimate revival, through brutal death and exultant rebirth, his family’s undying flame bears witness to the spark of our nation. Born in September 1929 in the Romanian town of Vishive, Reb Mendel enjoyed the sheltered, wholesome childhood of a typical shtetl child. The third son of nine children, Reb Mendel’s memories of his youth are filled with boyish antics, strict yet loving guidance, and the sweet aromas of traditional Jewish foods. The Tessler home was one of strong yirah — unyielding chassidishe principles and stringent adherence to mesorah, but no less one of ahavah — parents and children glowing with the growth and happiness that Yiddishkeit brings. Vishive was considered a large Jewish community, with its own set of Jewish stores that remained open until the Nazis shut them down in 1940. Reb Mendel’s family were Vizhnitzer Chassidim, but the town had roughly 15 shuls. 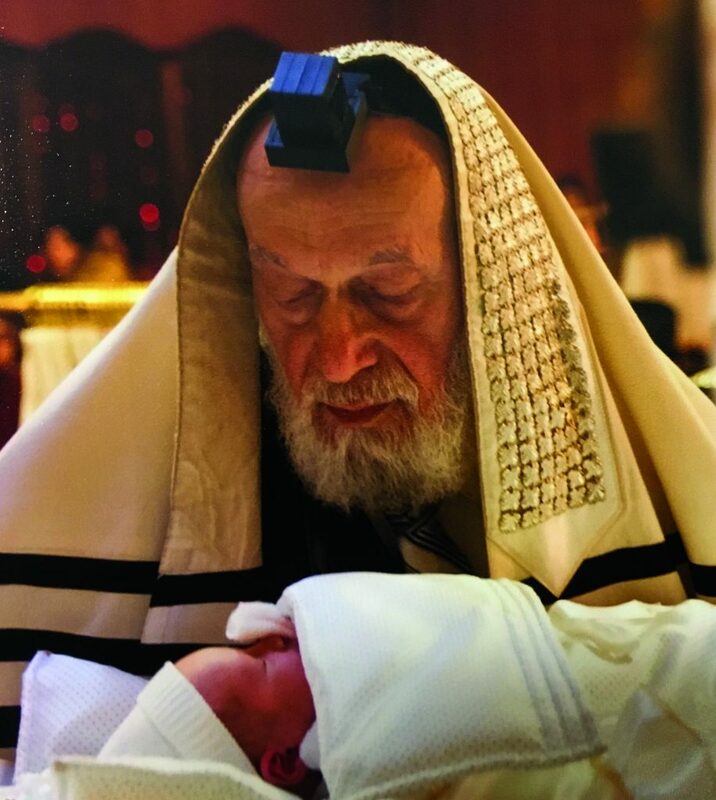 The atmosphere, Reb Mendel recalls, was one of vibrant Jewish life, or a “Shulchan Aruch in practice.” Elders were venerated and children were cherished, Torah was taught and learned in loud, ringing voices, and the age-old Jewish customs were preserved with the ardency they deserved. Reb Mendel’s memoir is replete with detailed memories from his childhood, from the laundry-washing techniques to the gebleterte kugel that his mother prepared for special occasions. He describes the shechitah and cheder systems, how meshulachim were assigned to different homes, and how his mother would spread a white tablecloth on the table before the designated “Reb Meir Baal Hanes chaverim,” as they were called, came to empty the family pushke. Yamim Tovim, each with its unique flavor, were hallowed and truly the highlights of the year. On Simchas Torah each child relished his own personal challah, baked fresh in the fiery oven, and Reb Mendel’s family would host a kiddush in honor of their father’s joyful purchase of Chassan Bereishis. On Chanukah, they would light in private for fear of raising the ire of the neighboring gentiles. Reb Mendel’s father had an interesting custom; on each night, he would light the first light and hand the candle to his wife to light the subsequent one, and then to each child in order. Reb Mendel perpetuated the same custom in his own home with his wife and children. Erev Pesach found the Tessler children airing out each sefer in the yard. They would also bring down the trunks from the attic, one for each Tessler daughter, and air out the tablecloths and linen that their mother was slowly preparing for the girls’ future homes. The first distinct rumblings of anti-Semitism began in 1936, when Jewish children were forced to attend school on Shabbos. Reb Mendel recalls his father instructing them to daven quickly at home and then searching the children’s pockets to make sure they weren’t sneaking any writing utensils to school out of fear of their teachers. In 1940, their region of Romania was annexed to Hungary, signaling the beginning of the end of the local Jewish communities there. At that point, Jews could no longer appear in public without the infamous yellow star. The Hungarians would randomly grab Jewish men off the streets and send them to hard labor groups, invoking a constant fear in all the Jewish constituents. By 1943, these nabbings were so common that little children were tasked with baking matzah for the community, for fear that adults convening for that purpose would be grabbed. “I was the redler, the one who made the holes in the dough,” Reb Mendel remembers. “The Hungarian presence did not bode well for the Jewish businesses, as the soldiers closed all the stores that didn’t have Hungarian licenses,” Reb Mendel relates. His father owned a general store that was situated in a separate structure in their yard and had once belonged to his own parents. The store was licensed to Fanny Traubkatz, Reb Mendel’s paternal grandmother, but renewing the license now was no simple matter. “The initial solution was to continue doing business quietly. We closed the front door, and customers came in through the back,” Reb Mendel recalls. After a short while, the Hungarians also forbade attending cheder or yeshivah. The Jews would gather in shuls instead, and the Rebbeim would come teach the children there. Shechitah was also banned, forcing the Jews to use all manner of tactics to try to outsmart the government. 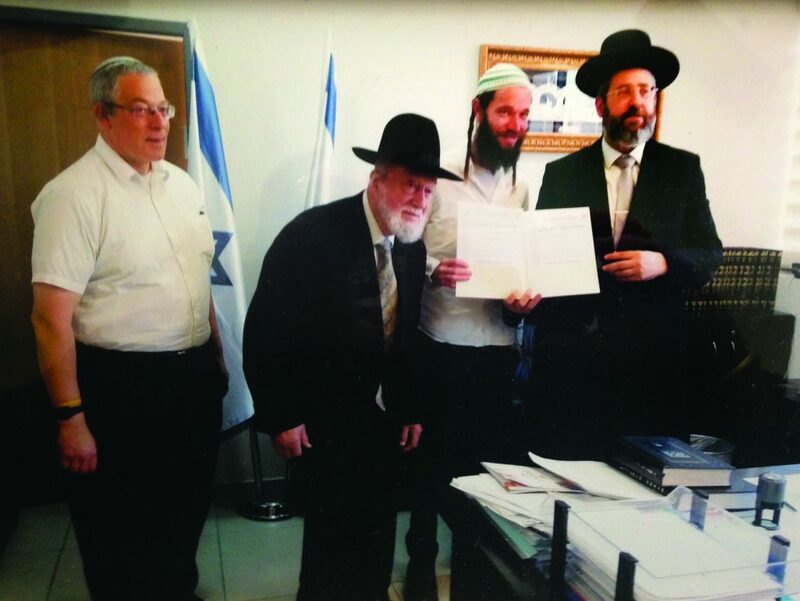 Reb Mendel Tessler, and his son Selig look on proudly as his grandson Aryeh receives semichah from Chief Rabbi David Lau in Yerushalayim. Two weeks after Pesach of 1944, the Gendarmes, Hungarian police (or “Feathers,” as the Jews dubbed them because of the feathers on their hats), marched into Vishive. They went from house to house, instructing each Jewish family to pack up and make their way to the ghetto. The ghetto was enclosed by barbed wire and heavily guarded by Hungarian guards. Life there was difficult, as there were too many people and not enough homes to shelter them. In one small area of town, the 5,000 Jews of Vishive were joined by another 10,000 refugees from surrounding areas, making for virtually unlivable conditions. On Sunday, May 21, 1944, less than three weeks after their arrival in the ghetto, the community was herded onto trains heading to an unknown destination. Reb Mendel distinctly recalls his father bringing his two record books, the “new book” and the “old book,” with the customers’ accounts from his store, which essentially held the records of his entire fortune. Clearly, despite the precarious situation, he still held on to the desperate hope that at some point life would be normal again. The Jews were told they were being taken to a farm in Hungary where able-bodied men would work and the women would look after the children. Though they hoped these promises were true, they had already heard rumors of inhumane conditions in Nazi camps in Poland. The adults knew the train would first have to travel to the central station in Kashau, and there they waited with bated breath to see whether it would continue in the direction of Hungary or Poland. When it left the station in the direction of Poland, not the promised safe haven in Hungary, the adults grew tense and quiet. They knew that trouble awaited them, yet they had no way to escape and nowhere to run. They rode the train for three endless days, heading to the worst man-made hell on earth. On Wednesday, May 24, 1944, they pulled into the beastly inferno that was Auschwitz-Birkenau. Before they disembarked, a remarkable incident occurred. “There was another train waiting on the line parallel to ours,” Reb Mendel shares, “and the people called out to each other to see where that train was from and who was on it. Incredibly, my parents discovered that my maternal grandfather from Vilchovitz, whom we saw very infrequently, was on the car directly opposite ours!” The car had four high windows, so if the people climbed on one another, they were able to peek out. As soon as Reb Mendel’s mother realized her father was on the adjacent train, she turned over a big pot and stepped onto it to catch a glimpse of him. Through this phenomenal twist of Divine providence, these two Kedoshim shared a final conversation before both perished in the gas chambers. Young Mendel had no time to dwell on the exchange, as he was propelled forward toward his first selektzia. He was forced to drop his precious tefillin and other belongings and suddenly found himself face to face with none other than Dr. Mengele, ym”s. His first question was, “Buba (boy), how old are you?” Remembering the words of the Kanada man, Mendel instinctively replied, “Sixteen!” He was tall for his age and apparently believed, because he was sent to join the other men who had been separated from the crowd. Soon afterwards, another split-second decision sealed his fate. Reb Mendel’s father reproached him for abandoning his mother and the six younger children who were with her. He explicitly instructed him to go join her, yet Reb Mendel held back and remained with the group, which included his father and two older brothers. “It was inexplicable. I never disobeyed my father in my life. But I had this gut feeling that I should just remain where I was.” And so, he lived, while his beloved mother and six younger siblings all perished that day. Hy”d. The man pointed to the clouds of smoke pouring out of the crematoria chimneys and declared, “Fin du geit men arois durechen koimen (From here you leave only through the chimney).” That was a turning point in young Mendel’s life, as he immediately resolved that he would leave the camp on his own two feet. He was determined to die with dignity and not be thrown into the fires. He could not think as far as liberation or entertain any hope for escape, but just wanted to live another day. It was this hope that he clung to in the months ahead. Soon afterwards, young Mendel was separated from his father and two brothers and ordered to join a group of teens. Though his father and brothers managed to survive together, Mendel remained alone and would not see them again until several months after liberation. In the meantime, Mendel lived through searing hunger and merciless lice, through nightmarish roll calls and feverish nights, through sweltering summer and brutal winter. He lived by focusing on surviving each moment, not allowing himself the luxury to process the horrific events around him, worry about his family, or think too far ahead. During each selektzia, as the accursed Angel of Death surveyed the columns of men, young Mendel would silently scream, “Zei mich nisht! Zei mich nisht!” (“Don’t see me!”) This was his prayer for invisibility, his desire to blend into the crowd of skeletons and not catch the eye of the evil doctor. Young Mendel managed to survive against every conceivable odd, bearing the flame of his emunah aloft and living for times like Rosh Hashanah, when an impromptu davening attracted tens of skeletal bodies with robust souls. He lived to tell his tale of courage and ultimate revenge against the evils he witnessed and endured. Reb Mendel Tessler serving as sandak at a great-grandchild’s bris. Even after long-awaited liberation day, Reb Mendel’s travails were far from over. A wayward bullet of an Allied soldier struck his leg, thus beginning a long saga of terrible pain, repeated surgery, crutches, and years-long difficulty walking. It would take many years, various operations and a long, arduous recovery until he was able to walk unassisted again. From the hospital, he went to the Feldafing DP camp in Germany, where he was reunited with his father, Reb Shlomo, and his two brothers. 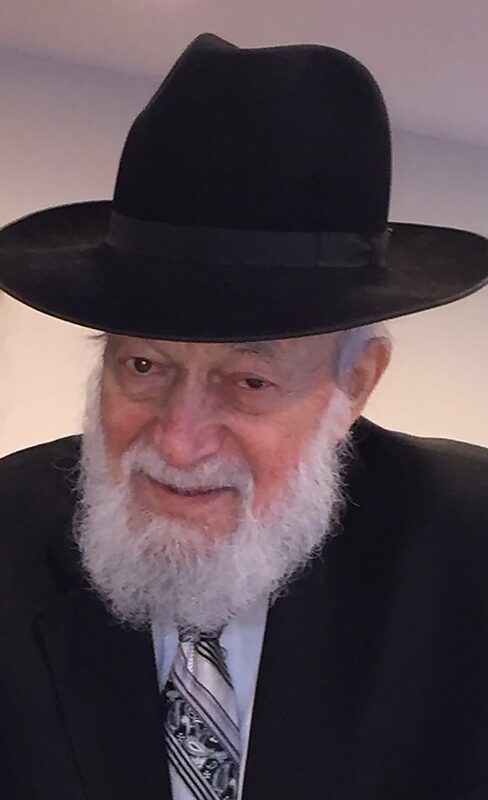 Despite losing his wife and his six younger children and barely escaping death himself, Reb Shlomo, a man of incredible faith and fortitude, knew he must move on. He opened a store in Munich outside the DP camp, working to establish himself financially so he could emigrate with his surviving sons at the earliest opportunity. Several weeks after Mendel’s arrival in Feldafing, General Dwight D. Eisenhower was expected to visit, sending a ripple of excitement through all the survivors. His visit fell on Yom Kippur, and his passionate address caused much emotion despite the language barrier. The Klausenberger Rebbe, zy”a, whose entire family had perished, then stood up to speak before Mussaf. With the help of an interpreter, he asked General Eisenhower for more food, more hospital space, and intervention with President Harry Truman to allow Jews to immigrate to Palestine. And then, though many of these broken souls did not understand the Rebbe’s words, the language of the heart reached them all, and they cried together over their unfathomable losses, both respective and collective. In 1949, Reb Mendel, his father, and brother Baruch emigrated to America, following his oldest brother Naftuli, who had managed to make his way there a bit earlier. “Building a new life in der goldene medinah was no simple matter,” Reb Mendel shares. But with the help of Hashem, they settled in and began the painful process of rebuilding life in a foreign land. In 1954, Reb Mendel married Nusia Ehrlich, the daughter of Rabbi Usher Selig and Rebbetzin Sheindel Ehrlich. Rabbi Ehrlich was a Bobover Chassid from Poland who served as a Rav and led difficult dinei Torah. Rebbetzin Ehrlich was the daughter of Reb Aharon HaKohen Schantzer, the Milewke Rav in Poland. The Ehrlichs had spent the bitter war years traveling through Siberia and had arrived in the United States in 1949, several months after the Tesslers. Mendel and Nusia were blessed with three children: A daughter, Esther, who was named for Reb Mendel’s mother, and two sons, Selig and Aron. Reb Mendel began a printing business and worked very hard to eke out a living. When the time came to send Esther to school, Mrs. Tessler was advised to dress poorly and request to pay minimal tuition. “But I refused to go along with that plan,” Reb Mendel says. “After I survived Auschwitz and was actually zocheh to send my child to yeshivah, I wanted my wife to dress in Shabbos clothes and offer to pay full tuition plus.” Indeed, the $20 tuition they paid was well beyond the average, but Reb Mendel never regretted it and attributes much of their children’s success to this priority. Indeed, Reb Mendel and his wife never lost sight of their gratitude and convictions, and together they raised their children on the foundations with which they were raised. Esther (Tessler) Alter shares her experience growing up in this very special home. “Contrary to the heavy silence present in many of my friends’ homes, ours was a happy home filled with warmth and laughter. My parents spoke openly about those they lost during the war — grandparents, siblings, aunts and uncles, cousins — painting their personalities and reminiscing about childhood antics and anecdotes in such a way that they felt real to us, as though we actually grew up with them ourselves. This provided us with a strong sense of belonging and a sense of being surrounded and protected by a large loving family, despite the fact that we were in truth only a very small family left after the war.